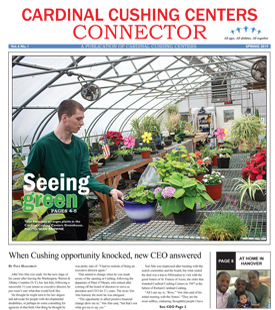 Cardinal Cushing Centers offers Shared Living, which ultimately is a home in which a person with disabilities lives with a non-disabled person who has accepted contractual responsibility for the well-being of the person. Shared Living is a person-centered model that allows people with disabilities to live in a qualified home within the community. Cardinal Cushing Centers recruits, screens, trains and delivers on-going support to caregivers who meet the needs of the individuals based on a person-centered plan. Qualified caregivers receive ongoing financial, behavioral and nursing support under this model. Shared Living is program supported by the Department of Developmental Services (DDS). This program supports the continuity of care through one consistent and qualified person who understands the individual as a whole. Shared Living is the ideal situation for someone who does well with one on one attention and struggles with “staff” changes. Through our shared living experience,we have found that having one consistent care provider not only deepens the relationship between two people but also strengthens access to the greater community. Ryan O’Kane at ROKane@cushingcenters.org or (781) 829-4643.